2014 will be the first time in the Al Golden era that the Hurricanes start the season without the specter of NCAA Sanctions. Clearly the absence of its’ dark shadow has paid immediate dividends in recruiting. But could it help contribute to success on the field as well? The coaching staff under Al Golden has never appeared to lack confidence, even when things aren’t going well. But the decision of Golden and Offensive Coordinator James Coley to name true freshman Brad Kaaya the starting QB, emanates in self assurance. All the confidence in the world, and a successful season from Kaaya, will not mean a thing if the defense does not improve. UM will have to do better than 2013 when this highly scrutinized unit surrendered 27 ppg and over 426 yards a contest. The good news is, they finally have some of the pieces to make it happen. RB Duke Johnson – Clearly Miami’s best overall player, Johnson has added muscle to his frame and is now over 210 pounds. He has also gotten faster, with a 40 time hovering right around 4.4. Johnson has tremendous quickness, surprising power, and the best stiff arm in College Football. WR Stacy Coley – Last season, to no one’s surprise, the freshman All-American was a big play threat waiting to happen every time he touched the ball. At 6’1 he has good size, and his hands got better each time out last year, but where he really excels is running after the catch. This spring/fall the precision with which he ran routes also appeared to be sharper. The sky is the limit as far as Coley is concerned. LT Ereck Flowers – Potential future first round draft pick in the NFL. He has been quietly and consistently spectacular from the day he stepped on campus. LB Denzel Perryman – Human wrecking ball who covers a ton of ground and hits like a mack truck when he gets there. DP needs more help from his front 4. If they can keep offensive lineman from getting to him at the second level, he should wreak havoc all season long. 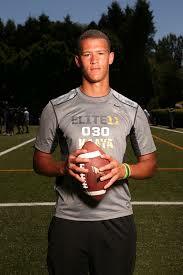 QB Kaaya – for obvious reasons. DE Chad Thomas – the best freshman on the team is going to see action ASAP as a pass rusher. If there is any obvious Achilles heel on this team, it remains interior defensive line. With play makers nearly everywhere else on the field, this is the spot opponents will look to expose most often. How well these guys hold up could dictate how successful of a season UM has. 1) Keep Kaaya out of too many third and longs. 2) Stop the run. With DeVante Parker sidelined, Miami would benefit greatly if they can make the Cardinals one dimensional. 3) Win the turnover battle.